PLACE pumpkin, vinegar, olive oil, maple syrup, olive oil, onion, garlic, ginger and salt in blender container; cover. Blend until smooth. 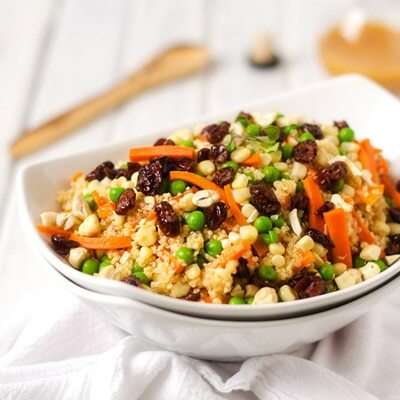 COMBINE quinoa, corn, peas and carrots in large bowl until mixed. Pour 1/2 cup Pumpkin Vinaigrette over the quinoa mixture. Toss until all ingredients are combined, adding additional vinaigrette to taste. Refrigerate until ready to serve. TOP with cranberries and chopped cashews. Serve with any remaining vinaigrette.